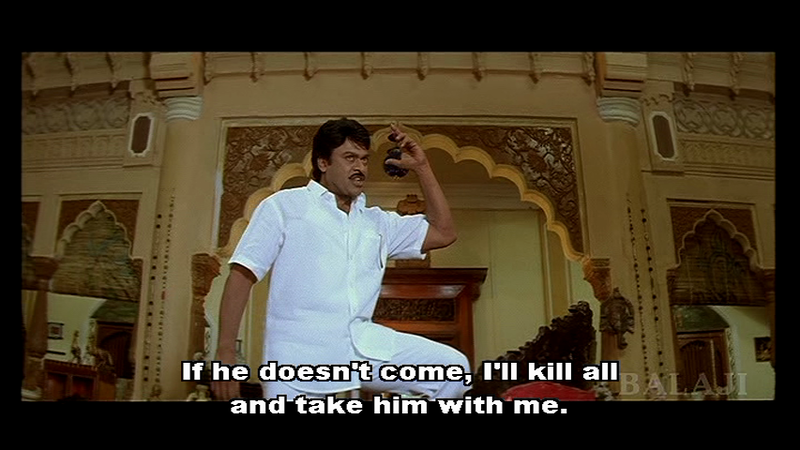 Indra is a really entertaining vehicle for Chiranjeevi, combining action, melodrama and music in a visual feast. I say entertaining despite a huge bodycount and an impressive gore budget. The violence is so over the top and cartoonishly bloody, the baddies are so one dimensionally bad, that I couldn’t take it seriously.I also had to laugh at this little moment in the opening credits. Really Paruchuri Brothers, you call yourselves ‘writters’? It’s clear there is a connection between the two episodes, but the first part of the film is all about the peaceful family man. Well–he is a man of peace, until he isn’t. Chiranjeevi is all hero and there is no doubt this is his film. The action scenes are action packed, the dancing is high energy and the speeches are compelling. 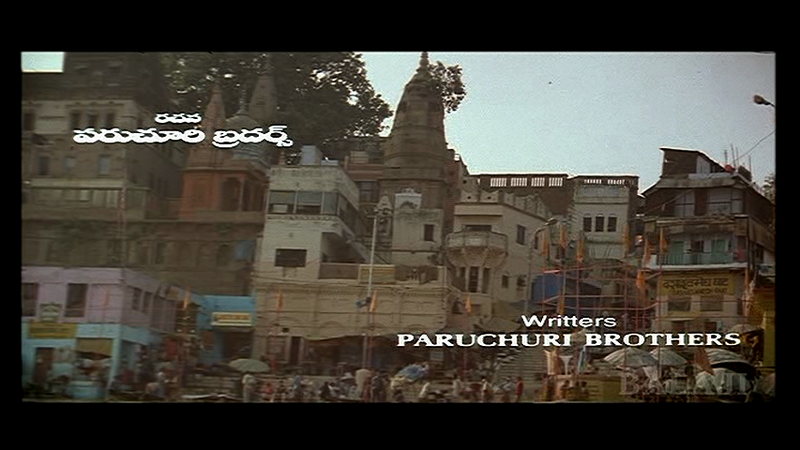 This is not a film that demands subtlety but Chiru adds a bit more emotion and credibility than I expected. And he does it in plaid, in sequins or in a lunghi. So versatile! I don’t understand why people keep asking me why I love him – surely it’s obvious. Sonali Bendre is the smitten Pallavi who pursues Sankar and schemes her way into his household (and incidentally, out of an unwanted marriage). Her machinations are highly amusing as is Sankar’s discomfort at her flirting and they have good comic chemistry. Sonali’s overacting is excellent, and her fake filmi gestures are spot on for this role. She also gets the full support of the wardrobe team, although I have my doubts about the footwear. Is she wearing yellow fluffy slippers? I wish I could say the Comedy Side Plot was funny but it wears thin very quickly and Brahmi and gang overstay their welcome. Sunil does a more successful spot as a hapless brother-in-law and is on screen just enough. The drama takes place on an intimate scale as well as in an epic feud saga. Pradeep (Sankar’s nephew) is in love with Mumtaz, a Muslim, and their relationship is discovered. Later in the film Nandhini has her own troubles. I was perplexed by the suicidal tendencies of these young women but luckily they were not alone. Sankar never turns his back on his family and goes to bat for them, making a few message statements along the way. 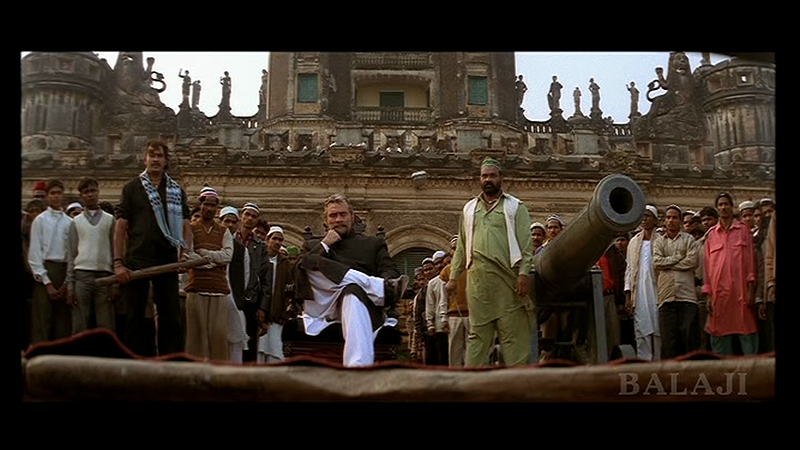 He also impresses Mumtaz’s father, the rich and powerful Shaukat Ali Khan (Puneet Issar). 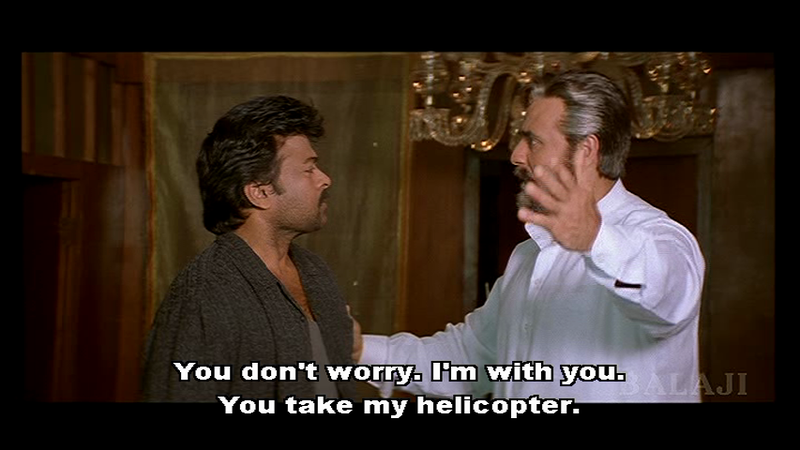 This comes in very handy when Chiru finds himself in need of a helicopter. 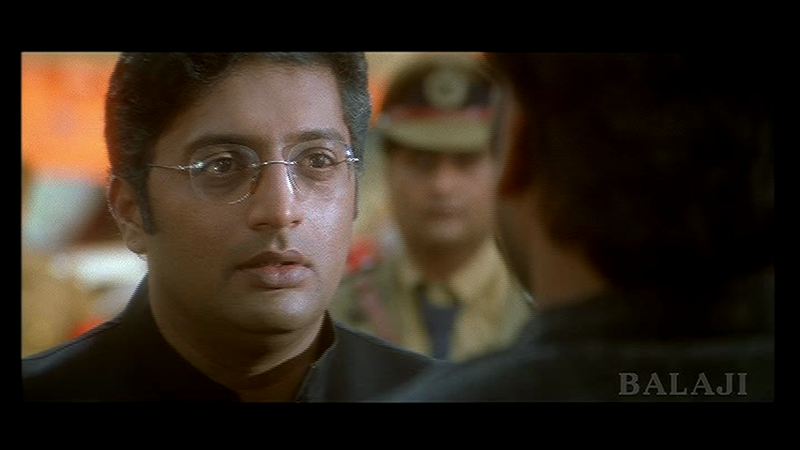 Prakash Raj comes to destroy the man he believes has ruined his daughter Pallavi, only to recognise Sankaranarayana as Indrasena. If you like your Prakash Dad frothing at the mouth screaming ‘shoot them all’ then this is for you. If you like your Prakash Raj and his Gaze of Blossoming Bromance, this is for you. Sankar makes Nandhini’s wedding a condition before he is free to marry Pallavi (when Prakash feels the love, he really feels the love and his decision making process is as rushed as when he is feeling the hate) so plans proceed quick smart. The wedding draws all the players out into the open. As soon as Mukesh Rishi dipped his toes in the Ganges, I knew bad things would happen. Tanikella Bharani is loyal Valmiki, apparently mute and certainly devoted to Indrasena. When things get ugly, he is the means of laying out the shared history of the characters. 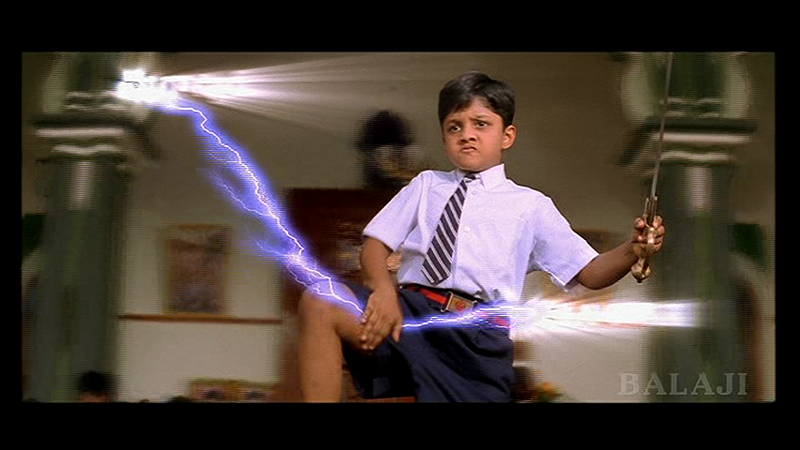 We also get an excellent montage of Chiru and heavy machinery as he displays his instant engineering skills. Snehalatha Reddy (Aarti Agarwal) is the other heroine, and she is not averse to throwing her weight around. While I found her unpleasantly abrasive in some scenes I enjoyed her performance immensely. She was filmed as many heroes are –the first shot a chunky shoe emerging from one of a convoy of cars, the framing of her walk, how she sits–and she has her own irritating and ominous theme music. Snehalatha has her own priorities and her interactions with the men are on the same level. Snehalatha has set her sights on Indra. But given her family history of betrayal her motives are suspect. Or are they? Her character is more developed than Pallavi and she certainly makes the stronger impression despite arriving later in the story. The chronology of the film doesn’t hold up too well under scrutiny, but there is an excellent 90s style dance number. It’s perfectly vintage right down to the costumes and locations (I choose to believe the dated look is an intentional statement). A hero as upright, generous and moral as Indra requires a weak, nasty and unlikable baddie as an opposing force. 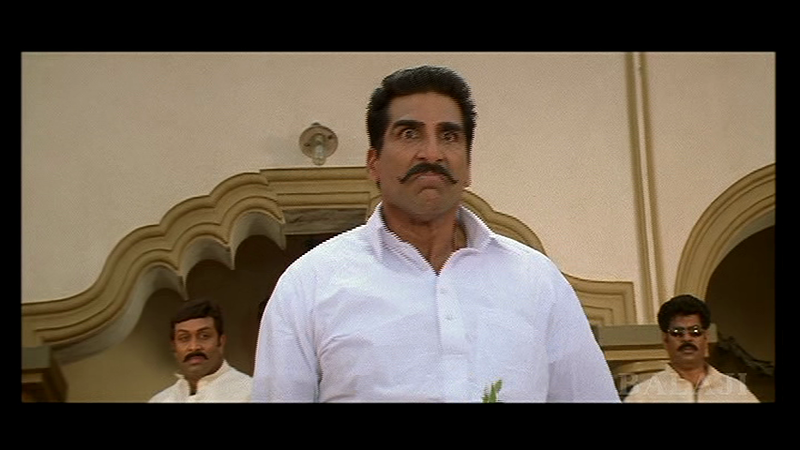 Veer Shankar Reddy (Mukesh Rishi) is that man. His villainy is more about excessive violence, obsession with supposed family honour coupled with total disregard for his wife and child, and finger pointing with a lot of “Rrrrrrrrrrey!” Mukesh Rishi has an excellent range of furious and outraged expressions, as does Chiru, and their confrontations are memorable. There is a big spoiler after this picture so scroll past the next paragraph quickly if you wish and rejoin me after the following set of pictures. There is a nasty incident in which Veer Shankar Reddy murders his young son rather than be indebted to Indra. This is ridiculous rather than real violence against a child but it shows how low the writers felt they had to go to make him bad enough. He is a liar and cheat, and sees no need to keep his word. This does put him at some advantage against his honour bound adversary but the final result is never in any doubt. Even the land he claimed seems to be against him at the end. Indra is kind of predictable but still kept me glued to the screen, so Chinni Krishna and B. Gopal should be congratulated on getting the basics right. All the ingredients work, and the visuals in Varanasi are beautiful. The songs by Mani Sharma are great and flow well in the story, and Lawrence and the other choreographers work to their stars’ strengths so the picturisations are just brilliant. There is an inconclusive ending with the two women vying for Indra, but we can all make up our own resolution to that. And I think Pallavi gave a pretty clear clue as to what she might propose. Chiru is awesome as the great hero, and Indra really is for the people! Well, for my kind of people anyway. I give Indra 4 stars (points off for unfunny funnymen and poor spelling). Heather says: Indra is a film for the megastar made on a mega-scale with a mega storyline! There really is a lot happening in this film and it seems as if the writers were determined to embody every trait of the divine Indra in the character of Indrasena Reddy. The basic story of warring families is expanded to include a number of romances, star-crossed lovers, vengeful wives, the building of a reservoir ( the ‘bringing of water’ ), street cons in Varanasi and even some politics! I do like young Indra with his self-important declarations, and the fact that throughout the story many of the women are very strong and decisive characters. Everybody has at least one impressive declarative sentence in this film. Initially I was concerned that Indrasena’s family are so very, very good while Veer Shankar Reddy’s family are so very, very bad, but then Indra starts hacking and slashing with the rest of them and it all becomes a bit too cartoon-like to be taken seriously. The whole side plot of Puneet Issar as Shaukhat Ali Khan, although I’m sure designed to show Indra’s compassion, courage and forgiveness, really seems to be just so that Chriu would have a helicopter to borrow – and that is absolutely fine with me! 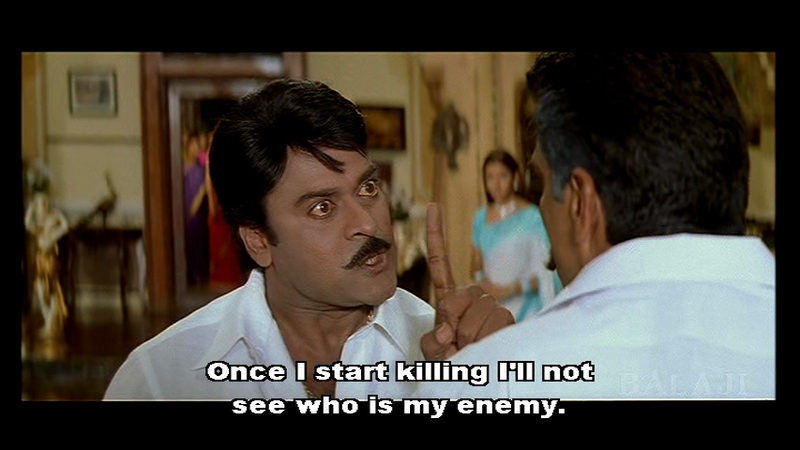 Chiranjeevi is as fantastic as always and is the reason the film works so well. His dancing is amazing and Lawrence’s choreography is immediately recognisable. 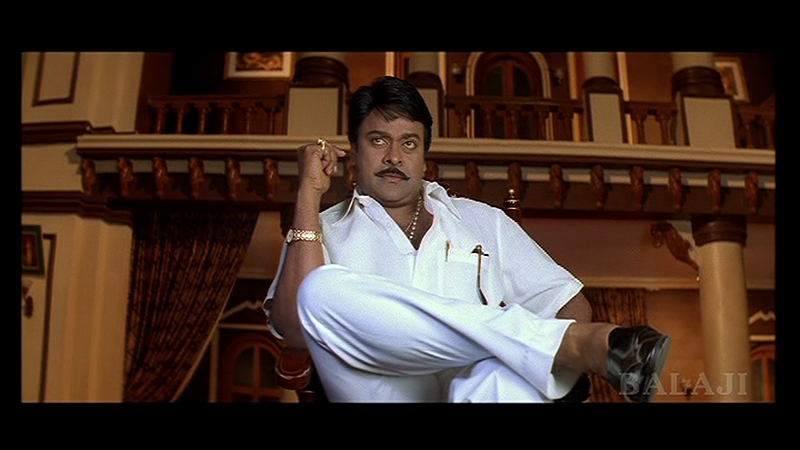 I was very impressed by Chiru’s moves as the dancing is very fast and physical and he pulls it off with nary a stumble. 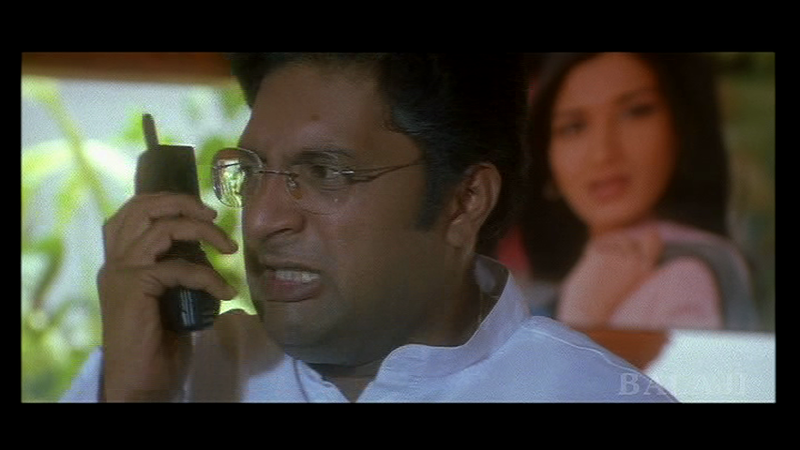 I also really like Aarti Agarwal as Snehalatha Reddy, the sister who fell in love with the enemy. I think her portrayal is well done considering her limited screen time and she comes across as a very strong character. Sonali Bendre on the other hand, although adequate in her role, doesn’t impress me as much, although a lot of that could be that I don’t really believe in her character. I can understand that she would fall in love with Indra (after all – who wouldn’t!) but her subsequent actions seem out of place, and I would have thought that the daughter of a politician should be a little more aware of the consequences of her actions. Indra’s treatment of her is also a problem for me. On one hand he is very avuncular and treats her appropriately as his niece’s friend as he resists her advances, but then later on he involves her in his deception back in the village which I was more uncomfortable with. I missed a lot of the final fight scene between Chiru and the brothers as John and I were trying to decide which climbing area it was filmed at. We’re pretty sure it’s just south of Bengaluru (Bangalore) but perhaps someone could let me know exactly where? I did get a bit distracted by the lines on some of those great granite boulders! Overall a very entertaining film as long as you don’t think too closely about some elements of the plot. I don’t think it would have worked at all without the star power of Chiru, but I still give it 4 stars – 3 ½ of those for Chiranjeevi and ½ for inspiring my husband to come back to India with me on my next trip to track down those climbing areas! This entry was posted in Tollywood and tagged Aarti Agarwal, B. Gopal, Brahmi!, Chiranjeevi, Chiru, Lawrence, Lawrence Raghavendra, Mani Sharma, Mukesh Rishi, Mukesh Rushi, Paruchuri Brothers, Prakash Raj, Puneet Issar, Sonali Bendre, Sunil, Tanikella Bharani, Telugu, Tollywood. Bookmark the permalink. Yayyyy!! Was waiting for this review from you.. 😀 Nice and long review… btw did you mention about his dances from “Dayi dayi damma” song .. or did I overlook it in your review? I love it! 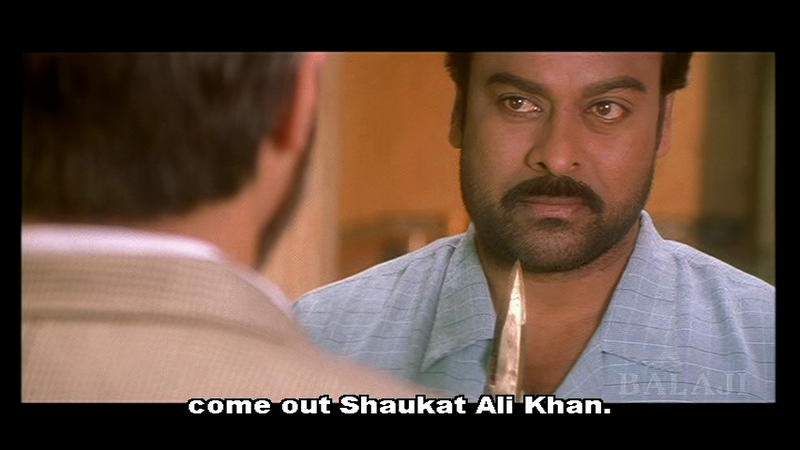 One of my favourite masala entertainers, and Chiru’s Megabeard only enhances its appeal. I liked the twists in the story and I was totally sold on all the side plots with dubious motivations (helicopter chase – yay!!). I do appreciate how they manage to include a ton of social messages into dishoom masala, and I have come to associate that with Chiru’s films, which always adds a new layer of appreciation from my part. Such a fun review!! Glad you wrote this one up! finally,the review of indra from u.yayyyy..i hope u throughly enjoyed the film.i just wanna share some info abt the sideplots u mentioned. regarding mukesh rishi killing his own son:i think that was inspired by some real life incident in the rayalaseema region which is infamous for extreme chavunism for family honour. (i’m not certain of that,just heard it somewhere). regarding the social message:all chiru’s films from indra onwards r message oriented n this film is particularly considered by some as the one that showed his political ambitions. regarding the climbing areas:i think the climax was shot in rayalaseema area in andhra pradesh,probably in the districts of chittor or kurnool. finally,r u married? ?i never knew that.if u r a recently married girl,then my best wishes to u…. Regarding the climbing, my husband was sure it was the granite areas near Bangalore (which we drove past but didn’t manage to climb at). My memory isn’t that good, so I really wasn’t sure! But do you know if there are climbing areas in those areas? There were some excellent lines on the granite boulders for sure! Yes, I remember you did say that before 🙂 – so do you know if there are climbing areas there? It would be a really good way to persuade John to come with me to India! Thanks for the review. It’s one of my favourite movies and loved everything of it. I read all your reviews especially of Chiru movies. Waiting to see a review on Tagore movie of Chiru from you.